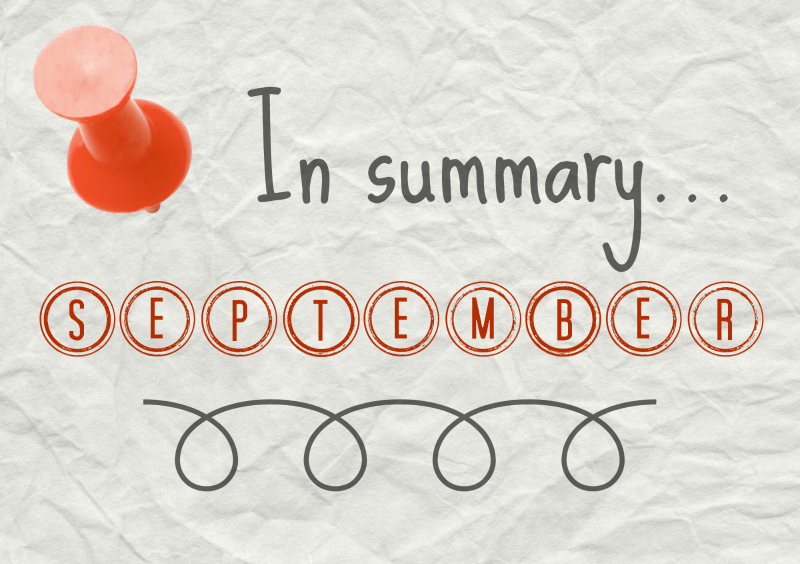 My Month in Reading (and More): So Long, September! Where did this month go?! Oh... right. My Goodreads tally leaves me with four books read this month, but I humbly request that the 24+ hours I sunk into IT by Stephen King are duly noted! Ring, by Koji Suzuki — This was some Japanese horror, and I will probably write a mini-review about it. The Heart Goes Last, by Margaret Atwood — I doubt I have to tell anyone here that Atwood had a new book published yesterday. I haven't had time to properly digest this one yet, but expect a review before long! The Fever, by Megan Abbott — Just the thriller I needed when everything else felt like too much effort. It took me right back to my high school days (you know, minus the mass illness). I asked you to help me win Books on the Nightstand bingo. I didn't end up reading anything you guys recommended (oops), but I won anyway! I started a brand new roundup feature as a way to keep the blog going while I devote ungodly amounts of time to the graduate school application cycle. Thanks again to all the great bloggers I featured in Issues #1, #2 and #3; I couldn't keep this place running without you. I pledged to read a whole bunch of creepy literature as part of R(eaders) I(mbibing) P(eril) X, hosted by the fabulous Estella Society. There's still time to join in! Because I was already thinking about things that go bump in the night, I asked my fellow horror fans to weigh in on why they love being scared by their reads. I watched Being John Malkovich for the first time ever on 35mm film! Oh, who am I kidding. I mostly did math (and tweeted at Shannon about it). I will finally take the GRE and hopefully never blog about it ever again, for all of our sakes. Dewey's 24-Hour Readathon is October 17! It's a full day of reading, socializing, game-playing and prize-winning. I know I say this a lot, but, seriously, do this. The October event is extra special because it's the whole reason I ended up starting this blog. Yup, that's all I've got. How was your September? Okay, I need to know how The Ring book compares with the movie... I can't wait to read what you have to say. I've been back and forth if it's different enough to read. Also, yay horror! I need to dig into a good one this month in honor of my favorite holiday.